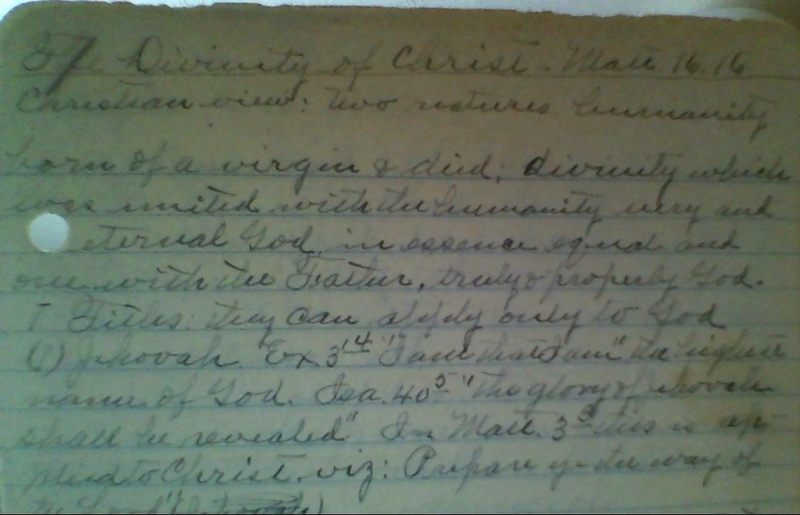 My great-grandfather referred to the 1940 General Conference of The Methodist Church (1939-1968), for these sermon notes come from late 1938/early 1939 to 1942 set, and the Methodist General Conferences meet every four years. The church faces the tragic needs of the world at home and abroad. There are many and great needs. The greatest is spiritual. Only the church can be looked to to supply it. 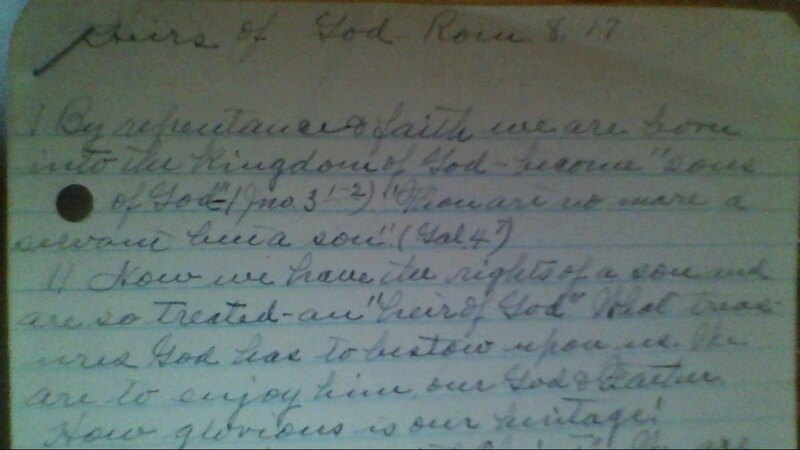 “Ye who are spiritual restore such as one,” etc. Others won’t and can’t if they would. Paul would have us all begin in prayer. We, the church, need to draw near to God in prayer. We need a fresh experience of his grace until our hearts are strangely warmed. We can’t lead others into an experience we do not have. “That I may know him,” etc. Pray “for all men.” This is good and acceptable unto God. The heart aglow with love for all men yearns for the salvation of the world. 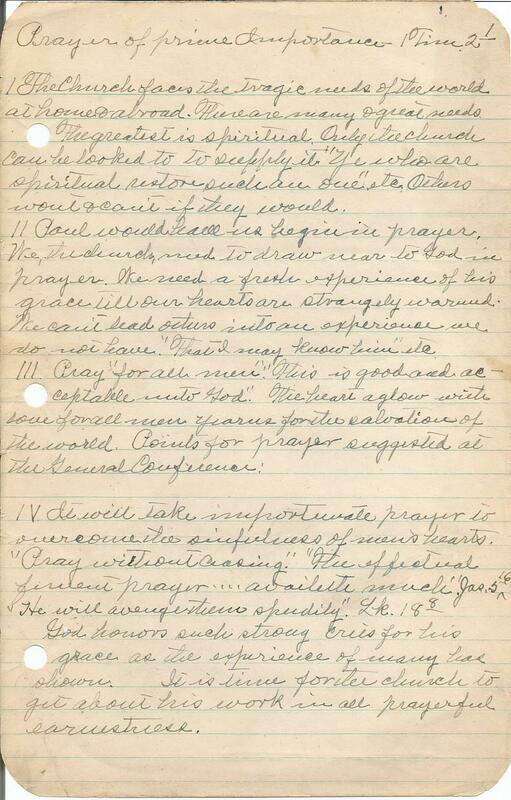 Points for prayer suggested at the General Conference. God knows such strong cries for his grace, as the experience of many has shown. It is time for the church to get about his work in all prayerful earnestness. O God, be merciful to me. Cry, God be merciful to me. For God is merciful to me. Our need of divine aid. We are unable to do the work before us if left to ourselves. “Without me ye can do nothing” (Jno. 15, 5). “Not by might nor by power, but by my Spirit” (Zech. 4, 6). Prayer is an opening of the heart to God, throwing off indifference, so essential. How can God pour his Spirit into a heart closed against him? “But their heart is far from me” (Matt. 15, 8). Prayer is a direct, earnest request for God’s help. “Ask, seek, knock.” Give the Holy Spirit to them that ask him (Lk. 11, 13). “And when they had prayed the place was shaken where they were assembled together, and they were filled with the Holy Ghost, and they spake the word of God with boldness” (Acts 4, 31). Have we any need of his help, of awakening of souls, of pardon, of guidance of power? Does anyone about us need to know Jesus as Saviour and Lord? May God breathe on us the spirit of earnest prayer? And he prepares us and uses to help reach others that his kingdom may prevail over the forces of evil. 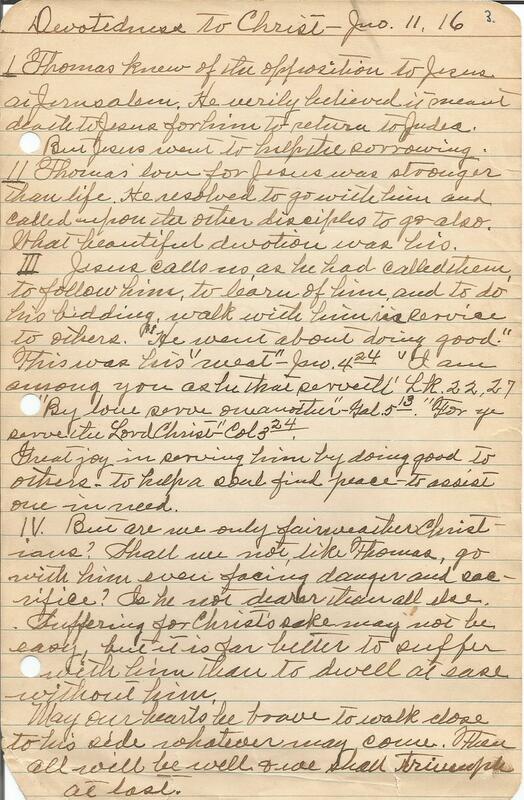 My great-grandfather’s use of “Jehovah” places him in time. 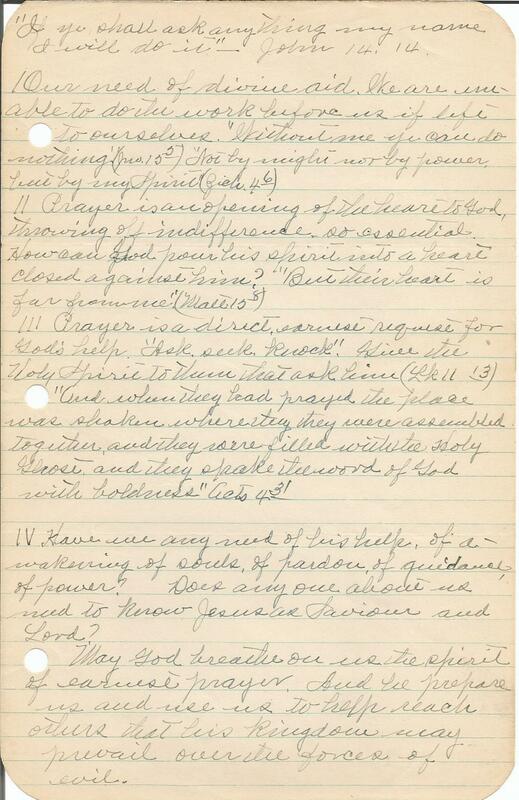 The American Standard Version of the Bible (1901) makes frequent use of that term, for example. That term has fallen out of use in many circles, with “the LORD” of “Yahweh” taking its place most frequently. For example, the Reformed Presbyterian Church of North America, in its 1973 hymnal, The Book of Psalms for Singing, uses “Jehovah” frequently. Yet the denomination’s 2010 hymnal, The Book of Psalms for Worship, replaces “Jehovah” with other terms, usually “the LORD.” (Aside: I do find having a collection of hymnals helpful for research purposes.) Nevertheless, on my way to church each Sunday, I drive past the building of a congregation which calls itself “Jehovah’s Temple.” I guess they did not get the memo. I note also that my great-grandfather had read up on developments in Christology during the first five centuries of Christianity. Christian view: two natures, humanity born of a virgin & died; divinity which was united with the humanity very and eternal God, in essence equal and one with the Father, truly & properly God. (2) Lord of glory: “Had they known it they would not have crucified the Lord of glory” (1 Cor. 2, 8). (3) “God”–Jno. 1, 1; Lord of hosts…the God of Jacob–Ps. 46, 7. In Heb. 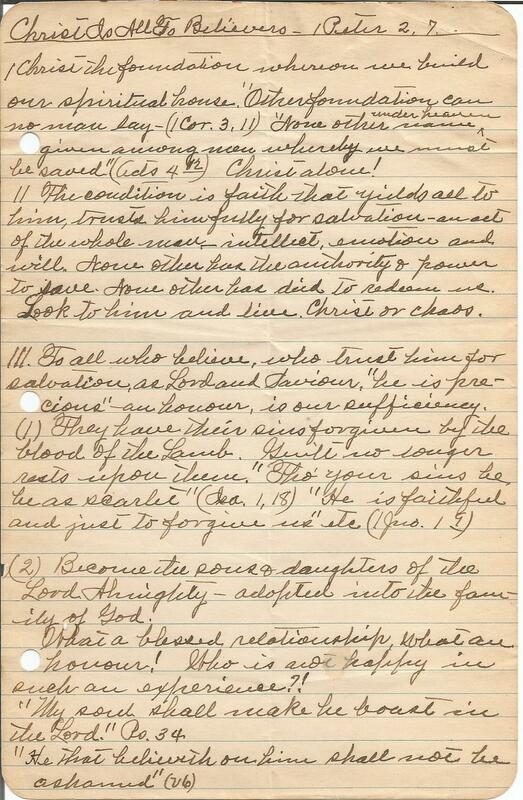 1, 8 this is applied to Christ. (4) Son of God: “I saw and bare record that this is the Son of God” (Jno. 1, 34). And unclean spirits…cried saying, “Thou art the Son of God” (Mk. 3, 11). “This is my beloved Son, in whom I am well pleased” (Matt. 3, 17). (5) “God with us”–Emmanuel. Matt. 1, 23, “God over all.” “Christ who is over all God blessed for ever” (Rom. 9, 5). “God was manifest in the flesh, justified in the Spirit, seen of angels, preached unto the Gentiles, believed on in the world, received up into Glory” (1 Tim. 3, 16). “And we know that the true Son of God is come. This is the true God” (1 Jno. 5, 20). A Saviour (Matt. 1, 21); “Son of the Highest” (Lk. 1, 32); “Christ the Lord” (Lk. 2, 11). His attributes prove he is God: All that are applied to God are applied to Christ–Eternity, Immutability, Omnipotence, etc. We baptize and dismiss the congregations in his name, pray in his name and the Father hears us. “Thou art the King of Glory, O Christ.